Three of Scotland’s leading meat processors, Scotbeef, Mathers and Scotch Premier are to merge. The result will be a new multi-million pound meat processing plant to be built at the Thainstone Agricultural Centre, just outside of Inverurie, where Scotch Premier and Mathers are presently based. The newly created enterprise will be led by Robbie Galloway, the managing director of J.W. Galloway (who own Scotbeef and Vivers), supported by ANM Group chief executive Pat Machray OBE, and with Mathers’ managing director, Michael Mountford in the on-going role of site director. The new team. 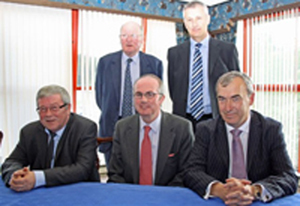 Front – Michael Mountford of Mathers; Robbie Galloway of J.W.Galloway; Pat Machray OBE of ANM Group. Back – Ian Galloway of J.W. Galloway; John McIntosh of ANM Group. Robbie Galloway said: “These are extremely challenging times for the meat processing industry in Scotland with the twin pressures of a shortage of raw materials and the continuous price pressure from customers. Pat Machray OBE, chief executive of ANM Group which runs the SPM meat plant, said: “This is a groundbreaking agreement to safeguard the traditional agriculture industry in this part of the world. “It has been roundly accepted that the current market for meat processing in the North-east is simply untenable and we have a responsibility to our members to move swiftly, addressing the issues at hand and making bold decisions to protect their businesses and a vital component of the Scottish economy. Half measures will only delay the inevitable, with an immeasurable and lasting impact on both the industry and the region. Michael Mountford, the managing director of Mathers said: “The directors of Mathers are delighted to be part of this combined business venture. Our shared vision for this new formed partnership is to secure the future of the meat processing industry in Scotland.